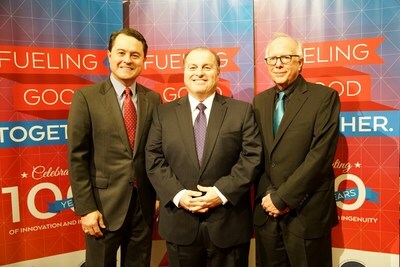 CITGO Kicks Off Year-Long Sponsorship of Texas Oil & Gas Association Centennial Celebration - CITGO Petroleum Corp.
AUSTIN, Texas, Feb. 21, 2019 /PRNewswire/ -- In celebration of the Texas Oil & Gas Association's (TXOGA) 100-year history, CITGO is sponsoring a year's worth of festivities and events. This week, the celebration kicked off with a CITGO launch ceremony at the State Capitol, followed by Texas Energy Day @ the Capitol on February 20. "For nearly a hundred years, the Texas Oil & Gas Association has been the backbone of Texas' robust oil and gas industry," said CITGO General Manager Community Relations, CSR and Legislative Affairs Larry Elizondo. "As a trade association, it has been instrumental in advocating for sound, science-based policies and free-market principles. The energy sector has always been a driver of growth within Texas, and TXOGA has been a pleasure to work with throughout the years. We couldn't be more pleased to sponsor this year's celebrations." Texas Energy Day @ the Capitol – which featured a breakfast, a speaker series, booth displays and opportunities to visit with elected officials – marked the start of activities, but the 2019 calendar is filling up with other events. In April, industry stakeholders will gather at the University of Texas in Arlington for an Energy Summit. Later in the year, CITGO and TXOGA will host events ranging from regional roundtables to STEM celebrations, and even Freedom Over Texas, the annual fireworks celebration in Houston on the 4th of July. "We're very excited for the Centennial Celebrations," said TXOGA President Todd Staples. "For 100 years, this organization has dedicated itself to advocating for the oil and gas industry. Every Texan benefits from a strong and stable energy sector and we're proud of all that this dynamic industry has accomplished. We are thankful for the sponsorship of CITGO as we celebrate a century of achievements. We couldn't ask for a better sponsor either. CITGO isn't just an employer – the company has been an indispensable ally to Texas communities for many, many years." CITGO and TXOGA will announce dates and times of future celebration as they approach. For the most up-to-date list, please visit TXOGA's events page here. Headquartered in Houston, Texas, CITGO Petroleum Corporation is a recognized leader in the refining industry with a well-known brand. CITGO operates three refineries located in Corpus Christi, Texas; Lake Charles, La. ; and Lemont, Ill., and wholly and/or jointly owns 48 terminals, nine pipelines and three lubricants blending and packaging plants. With approximately 3,400 employees and a combined crude capacity of approximately 749,000 barrels-per-day (bpd), CITGO is ranked as the sixth-largest, and one of the most complex independent refiners in the United States. CITGO transports and markets transportation fuels, lubricants, petrochemicals and other industrial products and supplies a network of approximately 5,200 locally owned and operated branded retail outlets in 30 states and the District of Columbia. CITGO Petroleum Corporation is owned by CITGO Holding, Inc. For more information, visit www.CITGO.com.